The H.M.S. Ramillies Association - Burlington man awarded France's Legion of Honour. Burlington resident William B. McConnell was awarded the National Order of Legion d’Honneur (Legion of Honour) medal on Sunday in Hamilton. 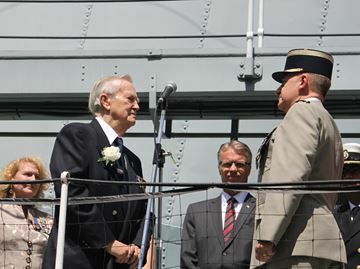 McConnell, now 93, received France’s highest-ranking decoration from Colonel Roger Vandomme, representing the French Consul General, aboard the HMS Haida. Also in attendance were Karen McCrimmon, Veterans Affairs parliamentary secretary, Burlington MP Karina Gould and Mayor Rick Goldring. McConnell served aboard HMS Ramillies from 1943 through to the end of hostilities. On D-Day, the ship provided bombardment support for two hours prior to the landings at Sword beach, and for the following 12 days. “In the course of her Normandy engagement, she fired 1,002 15-inch shells, thought to be the greatest bombardment by any single ship up to that time, and since,” recalled McConnell, who remained with Ramillies until the ship was withdrawn from service in 1945. “The paint had burnt off the guns, and the rifling was extending several inches beyond the end of the gun barrels. Back in Portsmouth an experienced team replaced the 15-inch barrels in a very short time, and the Ramillies proceeded to the Mediterranean to provide the only big gun support for Operation Dragoon – the landings in south France in August. McConnell served on five other ships covering the China Station, the Home Fleet and the Mediterranean, until he retired from the Navy in 1953. He then moved into the defence industry, working on radar targeting and control systems. He moved to Canada with Raytheon to work on satellite broadcast and phone systems in the high Arctic and has lived and worked across Canada, from Goose Bay to Victoria, and Tuktoyaktuk to southern Ontario. McConnell has lived in Burlington since 2008. 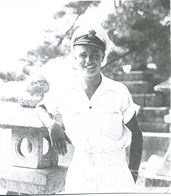 A young William B. McConnell in Japan.